Supplement with glucosamine, chondroitin and Opti-MSM supports dog joint health, and can help dogs become mobile with reduced pain. Liquid formula is palatable to the majority of dogs. Majority of customers say their dogs have improved within 10 to 21 days. Good alternative for chews and tablets, especially with picky dogs. Can be given to any size dog, with dosage listed on bottle. Affordable pricing compared to some alternatives. Majority of owners say the product really helps their dogs regain movement and freedom from pain. Some owners say the product doesn't help their dog. Not advised for dogs with diabetes. Liquid Health K9 Glucosamine is affordable on a per-dose basis, and its liquid formula helps the active ingredients get to work faster. The average time reported for improvement with Liquid Health's product was 10 days to 3 weeks. Some dogs who don't like chews and reject pills are easier to treat with a liquid formula mixed in their food or water. This product has a good price in its sector, good reported effectiveness, and owners say it's tasty and easy to use. Similar to humans, about 1 in 4 dogs will develop joint and mobility problems over the course of their lifetime. Liquid Health K9 review will let you know that this type of liquid joint supplement can provide a solution to your dog's aches and pains. It is also more easily absorbed than tablets or powders. A glucosamine and chondroitin supplement works by stimulating a dog's production of proteoglycans, natural substances that can preserve joint health and mobility. K9 Liquid Glucosamine for Dogs can help to prevent mobility issues in younger dogs, as well as ease joint problems in older dogs. What is Liquid Health K9 Glucosamine? K9 Liquid Glucosamine is a liquid supplement for canine joint health. 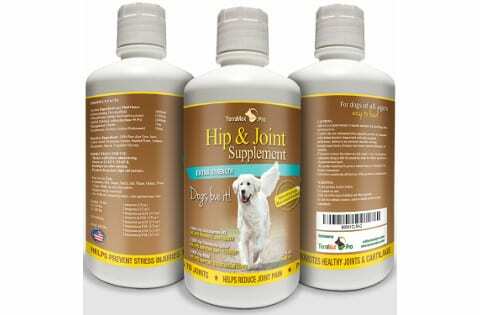 It contains chondroitin, glucosamine and Opti-MSM. Other active ingredients that help the supplement's absorbtion and support good muscle and joint function include manganese chelate and hyaluronic acid. The active ingredients are mixed in 100% pure aloe vera juice and triple-filtered water. The product also contains natural flavors and non-toxic preservatives. This product has chondroitin, glucosamine and MSM suspended in a pure, filtered solution of aloe vera and water. Together, these supplements have been found to have potential beneficial effects on joint flexibility. They may also reduce painful, inflamed joints, helping your dog to be more active and pain-free. Glucosamine can potentially alleviate joint damage and help to rebuild damaged cartilage, which is the main problem causing loss of mobility and joint pain. Chondroitin helps the cartilage to retain water, which reduces further wear, tear and pain. For about the last 20 years, supplements with glucosamine have been used by veterinarians in the U.S. and Europe to help reduce joint pain and increase mobility in dogs. 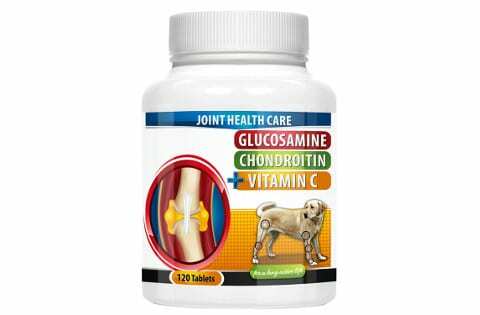 Liquid Health's K9 glucosamine may help your dog to rebuild joint cartilage, and strengthen and support existing cartilage. Rebuilding and strengthening cartilage has the potential to reduce joint pain and increase your dog's ability to exercise, move and play. The product's liquid form can help to increase absorbtion of beneficial compounds, particularly chondroitin, glucosamine, and MSM. Younger dogs might not show any signs of joint pain or stiffness, but the product's formulation could help them keep their cartilage strong and joints pain-free, preventing future illness. The benefits of liquid glucosamine sulfate, which is the type in Liquid Health's glucosamine for dogs, are backed up by several studies. In 2007, the College of Veterinary Medicine at the University of Georgia evaluated the results of 16 different studies evaluating dog joint supplements and veterinary prescription drugs. They learned that glucosamine supplements provided "moderate" joint improvement and comfort on a par with several prescription drugs. Glucosamine and chondroitin are natural substances and could help your dog rebuild cartilage and have increased mobility with less pain. They could help your dog to regain movement and feel less pain without the need for prescription drugs. The liquid supplement is more easily absorbed than pills or capsules. Liquid Health's glucosamine product for dogs also has a pooch-friendly taste. It contains Opti-MSM, a higher quality, safer form of basic MSM. Cons include the fact that glucosamine supplements don't work for every dog or every type of joint problem. A few dogs experience unwanted side effects like excessive tiredness or increased allergies. If your dog has diabetes, consult your veterinarian about giving glucosamine, since it is a sugar-based supplement. One fluid ounce of Liquid Health's K9 glucosamine for dogs contains 1600 mg of Glucosamine Hydrochloride (HCL) from shellfish, 1200 mg Chondroitin Sulfate (beef or pork), and 1000 mg of 99.9% Opti-MSM (Methyl-sulfonylmethane). It also contains 7 mg of Manganese chelate and 10 mg Hyaluronic acid. The non-active ingredients are pure Aloe vera juice, Citric acid, potassium sorbate, triple-filtered water, Sodium benzoate, Stevia and vegetable glycerin. Doses of Liquid Health's K9 glucosamine are administered based on your dog's weight. Will your dog like the supplement's taste? 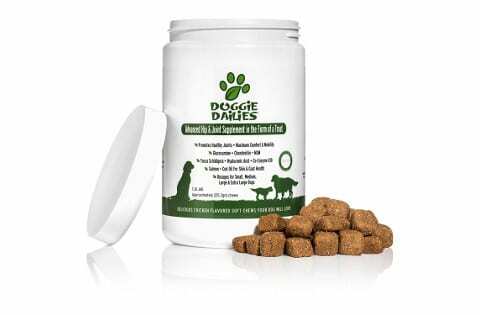 Many owners have successfully mixed this liquid supplement with their dog's food. The majority of owners report that their pets have received some benefit from the supplement, with dogs showing improved movement within 10 to 21 days. The product is also easy to use as a liquid, and many owners have turned to it after their dog rejected pills or chewables. A small number of owners reported that the company had failed a consumer test to determine how much of the active ingredients were included in each bottle. These customers accurately stated that there were no regulations on pet supplements and that manufacturing and quality could vary widely since tests are very limited and voluntary. However, another customer said Liquid Health was certified by the National Animal Supplement Council (NASC) and called it the strongest supplement they had used with three dogs, one of which had TPLO surgery at only 3 years of age. It might seem like a nitpick, but the bottle is opaque and a squeeze chamber on the side to measure dosage is also opaque. Customers said they couldn't really tell how much product they were squeezing out each time. Doggie Dailies Advanced Hip & Joint Supplement for Dogs comes in a package of 225 soft chews with glucosamine, chondroitin and CoQ10. They also contain MSM, yucca extract, and fish oil and vitamin supplements for hair and skin. The chews are made from food ingredients, primarily grains, chicken protein powder, and vegetables. Each chew contains 100 mg Glucosamine; 100 mg MSM; 50 mg Chondroitin; 50 mg Yucca Schidigera; 1 mg Co-EnzymeQ10; and 10 mg Hyaluronic Acid. Great alternative to expensive NSAIDS. K9 Care Labs Extra Strength Chewable Joint Supplement for Dogs comes in a package of 120 bacon flavored tablets. The tablets have higher amounts of glucosamine and chondroitin than other similar-sized and priced products. The tablets contain 500 mg. glucosamine sulfate, 400 mg. chondroitin sulfate, and 166 mg. Vitamin C. Inactive ingredients include brewer's yeast, sucrose, cellulose, and natural and artificial bacon flavors. 8 year old dog no longer struggles up and down stairs. Took about two weeks to see results but worth it! Just break it up and add to dry food. This company does their research: dog loves it. TerraMax Pro Hip and Joint Supplement for Dogs is a liquid glucosamine and chondroiton supplement that comes in a 32 oz bottle. Ingredients in each fluid ounce include Glucosamine Hcl (shellfish): 1600 mg; Chondroitin Sulfate (beef and/or porcine): 1200 mg; MSM (Methyl-Sulfanylmethane 99.9%): 1000 mg; Manganese Chelate: 7 mg; Hyaluronic Acid (as Sodium Hyaluronate): 10 mg. Inactive ingredients include 100% Pure Aloe Vera Juice, Citric Acid, Potassium Sorbate, Purified Water, Sodium Benzoate, Stevia, and Vegetable Glycerin. Excellent product: dog like a puppy again. Easy to administer: mix with milk and dog cleans the bowl. One month and dog is moving smoothly and happy! If you would like to know more then check out our TerraMax Pro Hip and Joint review. Dogs can be at risk of joint problems, mobility issues or complications of arthritis just like people, and in about the same numbers. You could lose precious years with your pet, and your pet could suffer a lot of pain and loss of mobility with joint problems. A liquid glucosamine supplement like Liquid Health's product could help restore mobility to your dog. Liquid glucosamine is more quickly absorbed, goes to work faster, and is more palatable to many dogs than chews or tablets.